Early this year, Marelize started working part-time as a group coach and personal trainer at a functional facility called Huba Fitness while still working her 9-5 job. 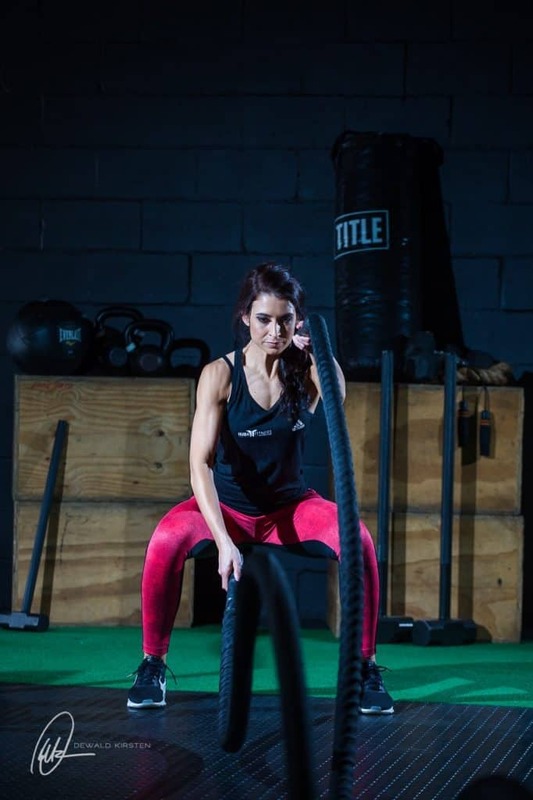 Today, Marelize Esterhuizen is now a GNC brand ambassador and working fulltime as a personal trainer after quitting her position in corporate, in pursuit of her newly found love for fitness. I grew up in a health-conscious home but was never very active. At university, unhealthy eating caused me to gain a lot of weight. After completing my studies, I was determined to get back into shape. I only really discovered my love for fitness in my late 20s (functional fitness specifically). I worked as a credit analyst for more than 7 years and decided to study personal training last year. A few months ago I finally resigned from my corporate job to pursue a career in fitness full time. What is the most fulfilling thing about being a personal trainer? There are so many reasons, flexible schedules, fun environment, but most of all, the ability to help someone! It is very honourable to have people come to us for “HELP”. I love seeing people’s smiles when they actually work hard and accomplish their goals! You are now full-time into fitness, what would you like to achieve? I don’t want ever stop learning and teaching. I think one must always be open to learning more whether it’s from material, other trainers or clients. Never settle. I want to educate and show clients that a healthy and fit lifestyle doesn’t have to be a pain or boring. Seeing results and the change in client’s self-confidence and how they carry themselves is definitely a highlight. Can you take me through your weekly training routine; how often do you change up your routine? I try to listen to my body and give muscle groups 48 hours to recover between workouts. If you do the same routine, for months and months you and your muscles might get bored. So I try to stick with the below ‘formula,’ but change the ingredients. Could you share your diet with Fitness Chat readers, please? What do you and don’t eat? I try to follow a balanced lifestyle (lean proteins, good fats, and good carbs). Instead of 3 full meals, I take about 5-6 small meals daily. I avoid processed foods, sugar and alcohol. I also allow myself one cheat meal on weekends. In the end we all human. If you mess up or go on a food binge, the best you can do is to just put it behind you. No need to do hours of cardio or go on a fast or guilt trip – just get back at it and FOCUS. I’m a proud GNC brand ambassador (they are exclusive to Clicks) so I only use their products. I take L-Carnitine prior to my workouts. It is sugar-free and fuels energy. I sip on Amino Acids during my strength sessions to support muscle protein synthesis and recovery. Whey Protein post-workout to support a healthy metabolism and lean muscle recovery. I take Casein protein shake for a bedtime snack because it is slow-release and supports muscle repair while I sleep. Feeling stronger, fitter and healthier keeps me motivated and seeing results is so rewarding. I stalk a lot of fitness athletes on Instagram 😉 I love Alexia Clarke’s journey. Basically, any athlete that enjoys what they are doing and that stays consistent. I’m also very inspired by new mommies that commit to getting their bodies back into shape post-partum. What fitness advice would you have for someone overweight who wants to lose weight and get fit? Break up your major goal into smaller, more manageable parts. Stay focused on the present. Be positive. Make goals short-term and specific. Measure and track. Be realistic. Celebrate and reward yourself. If you enjoyed reading this fitness interview, check out more Fitness Chats here. This is such an insightful post. Learning from those who are actually so much into the fitness field is so much motivating. The routine and diet she has shared is helpful in setting your own diet plan. I feel motivated already! She’s so strong! I love this post and it’s definitely giving my fitspiration vibes. Such a great interview! Reading about Marelize and all of her fitness success is so motivating to me. I especially love what she said about if you mess up with your eating plan to just put it behind you and move on. Great advice! Very interesting read. I love reading about fitness professionals and how the actually live their everyday life. That must of been very exciting, this is such an inspiring post. It is so motivating, My mood really does change when I workout and stay active, to stay in a healthier mindset, I hands down stay active and go on hikes and hit the gym every day. This article has such great fitness motivation. I really love this! I’m sure being a brand ambassador is so much fun. First of all, I want her abs! This was a great article! Good job! I liked reading about the kinds of food items she stocks up on. Lots of whole foods and protein. Good stuff! Great interview/chat! Her story is really inspiring how she went from a corporate job to doing what she loves and getting to help people at the same time! I would love for her to be my personal trainer – she’s sounds so positive, motivated, and dedicated! I took notes on her weekly training schedule, diet, foods and supplements – I love reading that kind of stuff! Will have to look into giving avocado oil a try!